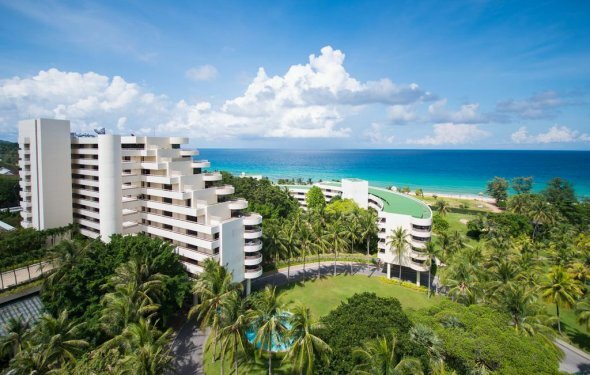 Hilton Phuket Arcadia Resort & Spa is an idyllic 75-acre resort in Phuket, set in lush, tropical gardens surrounded by mountains, waterfalls and golden sandy beaches located on the heart of Karon Beach and 45 minutes from Phuket International Airport. The hotel features Hilton Deluxe rooms all the way up to Royal suites with all rooms offering balconies with either sea view or garden views. Unwind with a traditional Thai massage in the Spa - cool off in one of 5 pools or just relax to the sound of the waterfalls. Sample fresh seafood and award-winning cocktails at Sails restaurant or go local at the romantic Thai Thai Restaurant. Relax on a lounger play on our own sandy beach among the palm trees or watching the sunset and romantic dinner at Ocean Beach Club. Younger guests may enjoy letting off steam in the Kidz Paradise and there are highchairs provided in the restaurant. The resort is located on the southwest of Phuket Island - all of the shopping and the very best Phuket attractions including Fantasea theme park - the city of Patong and Chalong Temple are just a short drive away.